On the 100th Anniversary of the Battle for Boars Head, two separate Memorial Services were held to mark the occasion. The first was held at 11.00am at the Bognor Regis War Memorial Hospital, where the WW1 Roll of Honour is situated. As this is a working hospital it was a very small gathering attended by The Deputy Lord Lieutenant, The Town Mayor and a representative from the Royal Sussex Regiment, who all laid wreaths in honour of those who fell in the conflict. To accommodate the schoolchildren who worked on the project a second service was held at the War Memorial outside the Town Hall at 1.30pm. The Deputy Lord Lieutenant, the Town Mayor, pupils from St Marys School Bognor Regis and Arundel CE School laid wreaths and crosses. Following the service, there was a chance for the children to showcase their work on the men of Bognor who died in the battle which was on display in the Council Chamber and the Mayor presented Certificates to all the pupils. Living relatives from one of the soldiers also attended. The last part of the project has been to collate all the research to be made into a Commemorative Book which can be downloaded here. Who put the Regis in Bognor? King George V gave Bognor the Title "Regis". On July 26th 1929 the accolade "Regis" was bestowed on Bognor. This year (2019) is the 90th anniversary of that memorable event. It was in January 1929 that it was announced from Buckingham Palace that King George V was to be moved to Bognor to recover from his serious illness. He had caught a chill in November 1928, probably at the War Memorial Service at the Cenotaph, which had affected his right lung. At the beginning of December 1928 the nation was told that his heart was weakening. The King became unconscious and after a lung operation he began his determined struggle for life. Finally on January 22nd 1929 came the news "The time is approaching when His Majesty’s removal to sea air will be advantageous". The residence selected was Craigweil House, which was "placed at His Majesty’s disposal" by Sir Arthur du Cross, Baronet. On Saturday February 9th 1929 Queen Mary arrived to await the King. One hour later the King arrived and so began thirteen weeks of recuperation for His Majesty. Royal visitors during their stay included the Prince of Wales and the Duke of York (the future Edward VIII and George VI), their sister Princess Mary, Queen Maud and Prince (later King) Olaf of Norway. On March 17th the King’s two year old grand daughter Princess Elizabeth (our Queen Elizabeth) came for a two week stay. In the brief period between February and May 1929 the Bognor area had been honoured by the presence of the reigning Monarch and three future sovereigns. The sea air proved to be advantageous to the King for although it was winter time when he recovered his health in Bognor with beneficial effects. Previous Monarchs had been accustomed to going abroad for their health but Bognor sea air was the tonic needed by King George V.
Bognor Regis can now bathe in the glory of our proud accolade. 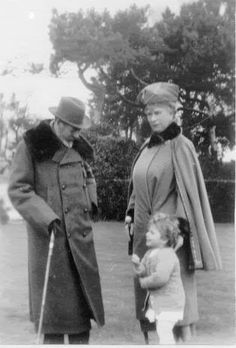 Their Majesties, the King and Queen with Little Princess Elizabeth, at Craigweil House, Bognor. Bognor had been using a coat of arms since the 1890s which combined the six martlets of Sussex with the arms of Sir Richard Hotham, the founder of Bognor as a seaside resort. This coat of arms was never granted by the College of Arms and appeared in many variations. In 1929, Bognor was granted the Royal Suffix of “Regis” by King George V and in 1935, Bognor Regis was granted a genuine coat of arms. The official grant of arms is housed in the Council Chamber at the Town Hall, and kept covered to protect it from light but traditionally uncovered during official Council Meetings. The gull’s wings on the crest show the resort’s association with the sea. Between the wings is a crown, commemorating the sojourn of George V at Aldwick. The oblong gold panel containing the martlets sits on a thrusting point, representing the sea wall. The blue and gold of the shield, which also contains a crown, stand for the sea and the sands. In 1935, the then Vice Chairman of the Council, Commander Hudson OBE, had a major hand in submitting the design and obtaining the grant for the coat of arms, so much so, that the Minutes of the Council Meeting held on 20th May 1935 resolved to record “A hearty vote of thanks be accorded to Councillor Commander Hudson for his valuable assistance in connections with this matter”. At that time, the motto for the Crest was actually “Action” rather than “To Excel” as it currently is. However, Commander Hudson was also a prominent member of Sir Oswald Mosely’s Blackshirts and “Action” was the title of a Blackshirt newspaper. After the start of World War II, Commander Hudson was interned by the British Government and the Town’s motto was an embarrassment. In 1940, the Council received confirmation from the College of Arms that they were entitled to use their discretion in the continued use of the motto and as a result, the motto was removed from the Crest, wherever it appeared, including the shield in the Town Hall. In 1944, the residents of Bognor Regis had the opportunity to choose their own motto and on 25th June 1945 it was recommended that the chosen motto “To Excel” should be adopted. Q: Which monarch was prompted to say 'B****r Bognor' and why? The monarch was George V renowned for his robust language. He didn't suffer fools gladly. There are two versions of the story. One suggests that having convalesced in the Sussex resort from an illness seven years earlier, when the King was on his deathbed on January 20, 1936, one of his doctors said: 'Cheer up, Your Majesty, you'll soon be in Bognor again.' He is said by some to have replied with the famous words before expiring. On Thursday 26th February 2015 a ceremony took place to unveil a Commemorative Paving Stone to honour Major General Sir Christopher Charles Teesdale VC KCMG CB, who was awarded the Victoria Cross following action during the Crimean War. 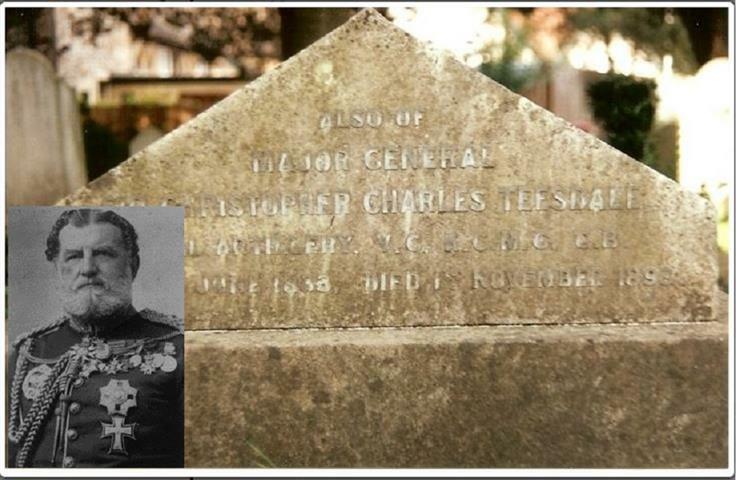 Christopher Teesdale was born in South Africa in 1833 and, like his father, was an officer in the Royal Artillery. During the Crimean War he took command of a force defending the fortress of Kars against the Russians. Following seven and a half hours of very heavy fire he rallied the Turkish artillerymen to return to their posts and then led the final charge which secured victory. After the action had ceased he stepped in, at great personal risk, to stop the Russian wounded from being massacred. He was mentioned in dispatches and received titles from the Turkish Sultan and also the 4th class of the French Legion d’Honneur. He was 22 at the time. When the Victoria Cross was instituted he was the 109th recipient, receiving his decoration from Queen Victoria when he returned from Crimea in 1857. He was promoted to Captain and Major in 1858, Lt. Colonel in 1868, Colonel in 1877 and then Major General. He was later awarded the KCMG and so became Sir Christopher Teesdale. His father had retired to the area and until he died lived in a house opposite South Bersted Church. Sir Christopher later moved to the house until his death in 1893. The Commemorative Stone was laid as part of a scheme set up for the WW1 centenary. The ceremony was organised by Bognor Regis Town Council and took place at the War Memorial at the Town Hall at 2.30pm on Thursday 26th. The Town Mayor, Cllr Tony Gardiner, and Deputy Lieutenant Roger Turner was joined by representatives from the Armed Forces, including Royal Artillery serving soldiers and veterans, other dignitaries and local Councillors. 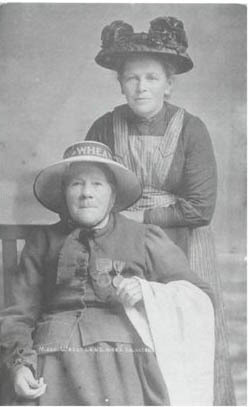 Mary Wheatland was a well known Bognor Regis Character, a woman who hired bathing machines from the east of the pier. She taught children to swim and saved many lives for which she received medals and recognition from the Royal Humane Society. Born in 1835 at Aldingbourne (three to four miles from Bognor) she later moved to Ivy Lane, South Bersted, Bognor and died at the age of 89 in 1924. Crowds would gather at the groyne to the east of the pier to watch her swim in her serge suit. She delighted in standing upside down so that just her boots protruded from the sea!! Mary Wheatland of bathing machine fame. Wallis Arthur came to Bognor in 1900 and subsequently turned the coal yard at the sea end of Lennox Street into the "Olympic Gardens" after neatly boarding it in and roofing it with canvas. He and his business partner Paul Hill were presenting Pierrots at other seaside towns. Unfortunately he lost money in his first three seasons until he joined the programme himself and helped to make his first profit. 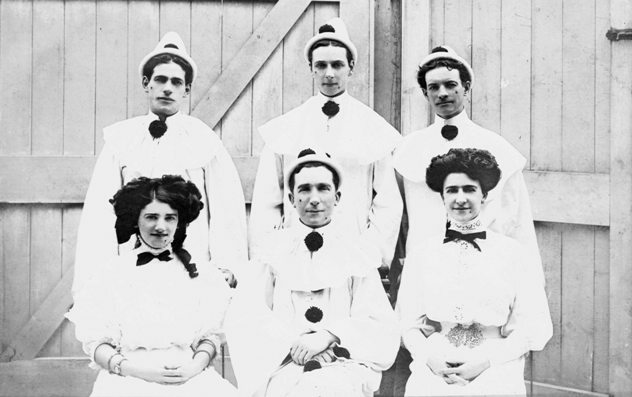 Members of his companies were interchanged and consequently the people of Bognor saw many young performers on their way to fame; Gillie Potter, Ernest Sewell and his marionettes (pictured right), Milton Hayes with his usual monologues such as “The Green Eye of the Little Yellow God”, and many others. One day a short good looking youth in a rather shabby blue suit and a straw hat came to see him. He wanted to be a Pierrot and appeared extremely nervous, pressing his light cane into the sand causing it to flick up into the air and then adeptly catching it. Wallis Arthur who had always had such a good judgement was sadly lacking it that day for he told him that he needed a light comedian – not a low one. So the young man went to America and the Cinema gained what Bognor had lost, for the man who wasn’t good enough to get a job in Bognor was Charlie Chaplin. Richard Hotham married Miss Frances Atkinson on 1st December 1743. She was aged 25 years and it is thought she might have been the daughter of his employer at the time. Their wedding took place at the chapel within Chelsea Hospital. They were later to have one son called John in 1751 sadly; however, he died after only one day. In 1746 Richard Hotham set up in business selling hats, the trade for which he is mostly remembered as ‘Hotham the Hatter.’ hence the name of the public house The Hatters in the Queensway and the sun bonnet sculpture on the corner of the Bon Marche shop in London Road. With local labour and materials he rebuilt the farmhouse into a ‘commodious mansion.’ This event was recorded in the Parish register by the Rev. Thomas Durnford, M.A. who was the Vicar of South Bersted, Curate of Felpham and Rector of Middleton. This event occurred on the 18th January 1787 and the entry in the parish records read, “The first foundation stone of a public bathing place at Bognor in the Parish of Berstead was laid by Sir Richard Hotham Knt. At the house called by the name of the Lodge.” Hence Bognor Regis celebrates its birthday annually on 18th January. The fine mansion had its own private chapel. The clock tower is the only remaining part of Sir Richard’s chapel. During the 1790’s there was a lot of development taking place throughout the district with Hothamton Cres. being built with 50 rooms and a tea room situated underneath its Dome. Spencer Terrace was a row of 7 houses. He also built his new home known as Chapel House, which was next to the original Bognor Lodge. On the 12th August 1793 the Duke of St. Albans was in the town to lay the foundation stone of the Chapel, being built to allow visitors to have their own exclusive area for prayer. In 1794 John Thwaites of London installed the distinctive clock, and this fact is clearly noted on the clock, which is still operating today in the tower attached to the house. In 1796 he sat for a portrait and this picture clearly shows Sir Richard Hotham sat, with his plans for Bognor below his arm. This picture can still be seen today in the Town Hall. There have been a series of owners over the years, culminating with William Holland Ballett Fletcher who became another benefactor of the town by creating the legacy of the horticultural rich collection of trees, shrubs and ornamental plants that are seen in the park today. He moved into the house, then known as Bersted Lodge, in 1899 and immediately changed the name to Aldwick Manor as he had inherited the Lordship of the Manor of Aldwick. In 1906, he was Co-opted as Chairman of Bognor Urban District Council and in 1910 he became a County Alderman. He was a very private man and never consented to being interviewed about his life and work. His wife Agnes Fletcher became well known in her own right for her unusual interest in reptiles, amphibians and rodents. William worked closely with Kew Gardens and at one period his plantings were compared with Kew as being an outstanding collection of species. We should remember that this was his garden and not the park we know today. The boating lake was his pond where he could be regularly seen standing at the side feeding his huge goldfish with bread. A cork oak he found at Goodwood is planted near the house to commemorate his wedding to Agnes. 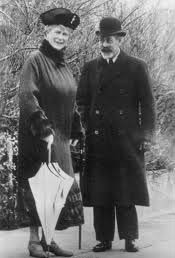 In 1939 she died at the age of 84 and within 2 years William also died, aged 89. This ended the Fletcher association with the house that had lasted over eighty years, since his father took over the house and completing over 40 years for William. Their deaths finished the private ownership of the house and park we know today. Following his death the house was leased to the Ministry of Pensions for the duration of the war. At the conclusion of the war it soon became obvious that no maintenance had been carried out, but it was still considered possible for the house to be used as a Museum, Restaurant, or community area for the town. Many letters appeared in the press about the use of the area but no plans materialised. However in May 1947 Captain Corbishley, Chairman of the Bognor Regis Council, opened the grounds as a park for the benefit of all. The house continued to deteriorate and in 1976, 35 years after Fletcher’s death, there were plans to demolish it and leave just the clock tower standing. Thankfully this did not happen and the original clock tower still houses Hotham’s clock from 1794, made by John Thwaites of Clerkenwell. The climb to the top is approx 63 steps. In 1977 Abraham Singer took a great interest in the house and purchased it. He was keen on its history and decided to restore it, both inside and out, whilst retaining the charm, character and features of the building. Subsequently the property was divided into several elegant apartments that are all privately occupied to this day. How many people are aware of the history of the site opposite the Royal Norfolk Hotel, which today is a Skate Park? Originally this site formed part of the Hotel grounds but was sold, for £60, in 1901. A local surveyor, Oswald Bridges, was asked to design a bandstand on this site to be used by the many military bands that travelled around resorts to entertain the public. Over the next decade it became more and more popular, so much so that the area was enlarged and deckchairs made available for visitors. By 1937 the bandstand became enclosed within a horse-shoe shaped wall and, still an incredibly popular venue, the opening of the newly designed feature was attended by around 3,000 people. In 1946 the addition of a roof appeared and the structure became known as the Esplanade Concert Hall. Though it continued to be used in high demand, audiences complained at not being able to see the stage area. Consequently, by 1951, improvements were made including the addition of tiered seating. At this point in time it became known as the Esplanade Theatre. The theatre continued to thrive, and was frequented by stars of the time such as Dusty Springfield and Roy Castle. However, by the 70's the number of visitors to the theatre had begun to diminish and the Esplanade Theatre closed in 1980. Numerous ideas were proposed for the development of the site upon which the original bandstand, and subsequent theatre, once stood and in 1996 the current Skate Park was constructed. For those who remember the Esplanade Theatre, and anyone interested in how it might have looked, there is a model on display in the Bognor Regis Local History Museum. One day in the hot summer of 2018 the Town Council was contacted by a lady by the name of Mrs Boyce who had in her possession a Newsletter called "Brought Forward". This was a report during WW2 "To all staff of Bognor Regis Urban District Council serving in His Majesty's Forces. The newsletter was dated December 1944 and held articles of interest both about the continuing work of the Council, life in the Town Hall and updates from Council staff working in the Forces. This lady was offering the Town Council the opportunity to own this as a part of the Town and Town Hall's History. A pdf of the magazine in it's entirety is available to download here "BROUGHT FORWARD"